The easiest way to lookup drug information, identify pills, check interactions and set up your own personal medication records. 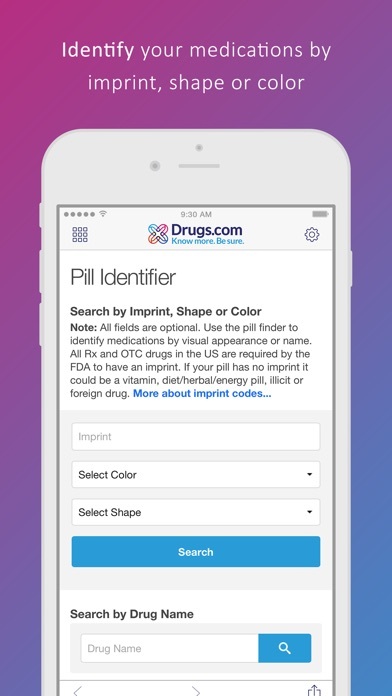 Key Features Complete Drugs A – Z listings Fast search, accurate suggestion engine and the most comprehensive database of drug information available online. Pill Identifier Identify any meds simply by entering an imprint, shape or color. Database updated daily. Interactions Checker Provides a list of interactions that may occur when different drugs are taken at the same time. Also checks food interactions automatically. 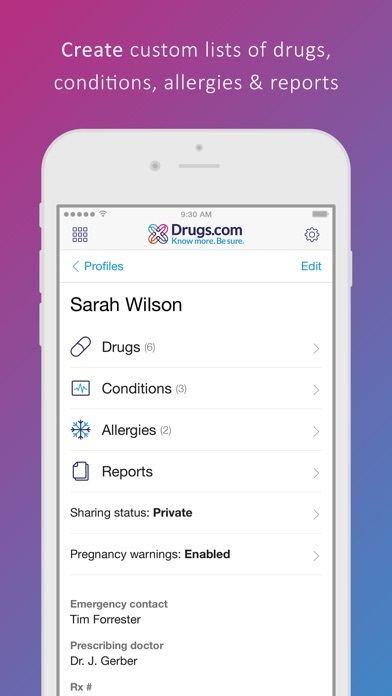 Personal Medication Records Add your medications to instantly assemble relevant medical information in a simple, easy to read personalized format. 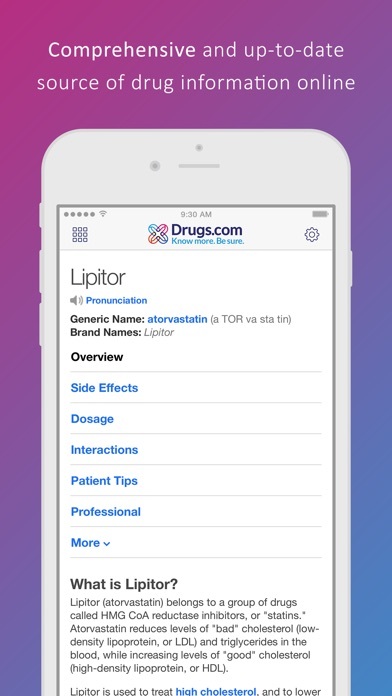 Access in-depth consumer information, FDA alerts, drug interactions, plus food, allergy and medical condition interactions. An invaluable tool for medication management and adherence. Discount Card Save up to 80% on your pharmacy prescriptions with our free drug discount card, accepted at over 63,000 pharmacies nationwide. Q & A Ask a specific question about your medication. Search on thousands of questions and answers. 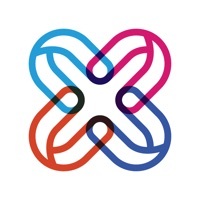 Health Professionals Quick access to all the tools you know and trust. Many more helpful tools. Quickly redo your recent searches. Try the Symptom Checker. 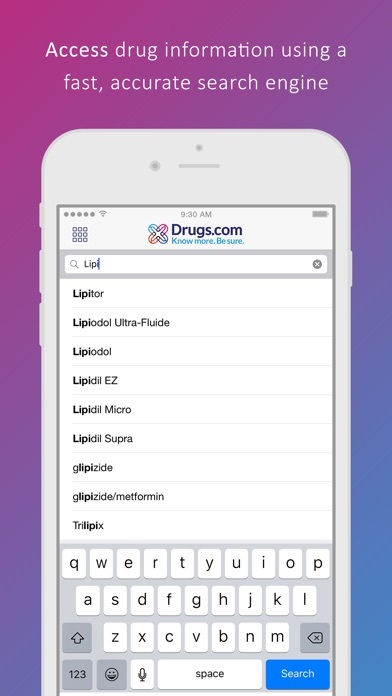 Lookup specialised databases for side effects and dosage information. Not quite sure how to spell a drug name? Use the phonetic search. Drugs.com does not provide medical or treatment advice. Always consult with a physician. Follow us on Twitter @drugscom for tips and updates. About Drugs.com Drugs.com is the most popular, comprehensive and up-to-date source of drug information online. Providing free, peer-reviewed, accurate and independent data on more than 24,000 prescription drugs, over-the-counter medicines & natural products. 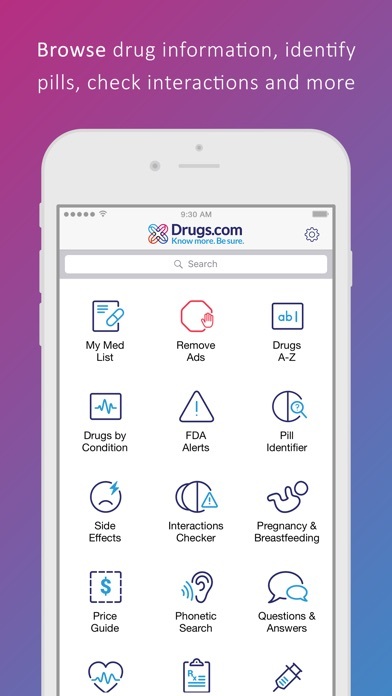 Drugs.com is a multiple Webby Award nominee and attracts more than 24 million U.S. visitors per month. App Support If you have any feature requests, suggestions or you simply need help, please visit http://www.drugs.com/apps/support/ and our responsive support team will prioritize your request. Awesome app for Nursing School!! As a general dentist I find myself using this app as an additional resource when cross referencing my patients medication. I love the drug interaction feature. I don’t like the email notification for reminders. I don’t feel comfortable having that information transferred via email. The reminders should be on the device. I’ll continue to use this app for information, but am using another app for scheduling reminders. I work as a Firefighter/Paramedic for a City Fire Department. I have tried many apps over the years to no avail. I downloaded this app recently and it has become my one stop, go to source for medications. It has made my work life much easier!!! Highly Recommended!!! Thank You Drug.com!!! Thank You for this App! Most invaluable tool. For someone who takes medications as much as I do it helps to have a resource as throughly as DRUGS.COM!!!,! I don't have to search for that one I a million site that kind of answers my question. I have a medical background, so I like that they professional section. Love the site. Love the multiple profile feature. I am able to keep list for myself and my father. Relief to know that I am emergency I have all the needed drug information. Excellent app. Has helped me great through nursing school and now through my profession. Mirrors the website. Has everything I need to know and more! I am a nurse and this app is very handy for all my questions about interactions, side effects, uses and more. I am always checking for new information relating to my situation.. I refer to this app quite a bit. Drug interactions, side effects etc. highly recommend it. Could not sign up for this app...select the lights, store front etc picture extremely frustrating. I take several medications and use this app regularly to keep track of possible interactions, side effects, and to educate myself on the medications I’m prescribed. Great App!! Use it a lot. It’s my go to all the time when I need info. I highly recommend it. Best app I have seen that helps inform about how ALL the medications my wife is on interact. I also use it to help guide informed questions when Dr’s want to change her meds. I can maintain a list, I do not need this app to do it. I needed to make sure my wife does not get over medicated again and this app helps me even know what questions to ask. Love this app quick and simple to use. As I am getting older and seem to be steadily increasing the variety of medications I take, it’s wonderful to have an app that keeps track of my drugs and also let me know if there are any interactions that I need to be aware of. As a RN I’ve noticed that frequently a specialist may not be up on all the interactions that are outside their specialty. This app has brought this to light several times. Even the best Pharmacist doesn’t get to look at all your meds every time a new one is added. Congratulations on a great app! Really a terrific App & website. The registration process can be a bit overpowering, but if you build your profile online rather than on your phone or tablet, it is a little easier. I really love the ability to print your prescription list even down to wallet size. Allows you to add the prescription number, also. Want to be able to identify a pill? This app does that as well. Type in the number that’s on every pill and it gets identified. Want to know if your prescriptions will interact with your other medications? Got you covered. Allows you to enter any allergies you might have. Let’s you know what conditions you might have and what medications treat the condition. It is the one stop app for anything and everything related to drugs. I absolutely love this app. Helps us keep up with meds. Also has great info on side effects. I am an RN and love this app. Great to take to physicians appointments and keep in my purse for emergencies. Your pro Allopurinol and lisinopril taken together your app says it’s a major drug reaction Called doctor and pharmacist at Walgreens and both say it’s fine no drug reaction why!!!! this app will do it all for you! I took the time to create my personal prescription list and was overjoyed that I now can pull it up, at a moment’s notice, for a Doctor visit, a trip to the ER, etc. Moreover, I can check stray pills for identification purposes, research medication information and side affects and so much more! This APP is the best . It does exactly what it was saying I would recommend it to anybody it’s a great app. It’s definitely worth five stars. Keep up the good work !!!!!! Excellent tool to have at the doctors office to check for drug interactions. This is my go to app when I’m questioning the interaction of medications, the dosages, or the side effects. Use it very often! I use this site to check to see if a new prescription will interact with my other medications. Also to look up pills that I find under my wife’s side of the bed. Clumsy, but I would not trade her or this site. I take a lot of medication from different doctors. No one has indicated any type of caution or warning about interactions. This site helped get everything straightened out. I am truly grateful for this site. I’d give it ten stars. Great Application. Easy to use. I’m always finding bottles of pills in my medicine cabinet that I have to look up to remember why I was taking them. This helps with that and loose pills that have fallen out of my weekly medication organizer. Good, easy to use and packed with features. Super informative. I really appreciate being able to read feedback about a drug by people who have used it. I am a RN and I use this app all the time. It has professional and lay persons formats. It is easy and quick to use. I have recommended to others, both professionals and lay people. I highly recommend it. January 22, 2019 11:24 a.m. Great application. I have used this application loyally since inception. Thing I have issue with: app used to be able to have different Medicare and other insurances and it would automatically inform me if my drugs were covered in by my plan or not. Also, the tier levels were available. As a visiting nurse I find myself needing to look up meds and this app is simple and handy to have!!! I have little knowledge about drugs, their effectiveness, names, side effects and what they do. So your site is amazing to me because there is so much good data on so many subjects. It’s honest and not contrived in any direction except for giving unbiased excellent information. I highly recommend this Application and now rely on it a great deal as I continue to take medications trying to heal myself. This application can not get any better it is perfect detailed for me as a physician I have it everywhere on my iPhone,iPad. It is easy to check drugs than carrying a book or the PDR and look in the index. It is my favorite medical toy! Excelente recurso de referencia y consulta. Es como tener un farmacéutico en tu casa. I have been using this app. for many years. It’s a great way to check the types of medications I am taking, as well as having a pill reminder.